A Web Widget is a tool that you configure, which allows users to opt-in to a list on a website. Once you configure the settings, custom code is generated for an embedded or pop-out widget. In this chapter we explain how to create and manage widgets. Learn about each in the following topics. You may access these tools from the Web menu in the Textboom toolbar or from the quick link icon on the Dashboard. The Widget Manager displays a listing of all widgets for your account. You can filter by OC (Operating Company), Agency, Client, or Status. You can edit, disable, re-enable, and delete widgets. You may also perform a search for a specific word or number. The listing will change to match any filters that you apply, and you can combine several filters to make your report very specific. To clear away any filter, you can perform a reset at any time. You may access this feature by choosing Web > Widget Manager from the toolbar. You can also access the SMS Campaigns by utilizing the quick link icons that are located under the toolbar on the Dashboard. New – add a new widget. Disable – Click this icon to disable the widget. A disabled widget cannot be used again until it is enabled. Delete – click this icon to delete the widget. A deleted widget is both disabled and invisible. The figure below displays the first few column headings. Underneath these headings, you will see a list of all your widgets. Click this icon to preview the widget in a popup window. Click this icon to edit the widget (you will exit the Widget Manager). Click this icon to disable the widget. A disabled widget cannot be used again until it is enabled. Click this icon to delete the widget. A deleted widget is both disabled and invisible. 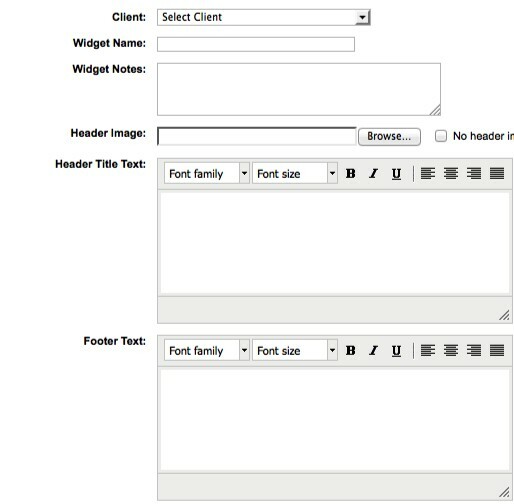 The Widget feature is a tool for creating an HTML widget that you can insert into a forms or display as a popup. We provide you with many options, and yet it’s quite easy to setup. You may access the Widget feature by choosing Web > Widget Wizard from the toolbar. Or by clicking on New in the Widget Manager. Next you may optionally choose different colors for Text, System Message Text, or the Frame. Click the circular icon next to these fields and choose the color. Typically, the width of a frame border is only a few pixels. If you want a thicker border, then enter the value (in pixels) for Frame Width. If you like, change the colors for the Button, Button Text, and Help Text. 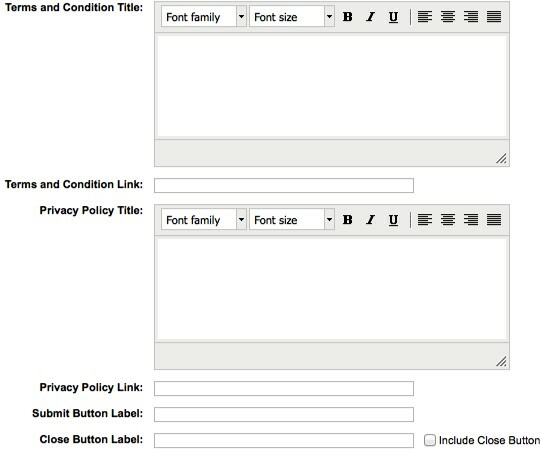 You might like to choose a different Font Style from the drop-down list, and also change the Font Size. Optionally, enter the Widget Notes. Click the Browse button for the Header Image. This image will appear at the top of the widget. If you don’t want a header image, check the No Header Image box. Next, enter the Header Title Text. Using the small toolbar in this panel, you may also change the font family, font size, and other formatting options. You can also resize this panel (and the others below) by grabbing the lower right corner of the panel and dragging it outward. You can also enter the Footer Text. As before, you may change the formatting using the small toolbar in this panel. (steps continue below the next figure). Optionally, you can enter a Term and Condition Title and a Terms and Conditions link. If you want something different than the default, then enter the text in the Submit Button Label field. If you want to place a button that can close the widget without submitting, check the Include Close Button box. Optionally, enter the text for the label in the Close Button Label field. Click Next to move on to the Data Fields step of the wizard. Choose the field type from the Field 1 drop-down listing. Check the Required box if this data field is mandatory. Optionally, in Field Title, enter a different label for the data field. If you want a narrower or wider field, decrease or increase the value of Screen Size. You may also add Help Text, which will display a hint when the user hovers over the field with the mouse pointer. The first field is now complete. To add another, click the Add link. To configure another field, follow the same steps above for the second field. You can move a field downward by clicking the Down link. Click the Clear to wipe the properties of a field; click Remove to delete a field. Click Next to move on the Database & SMS Campaign step. 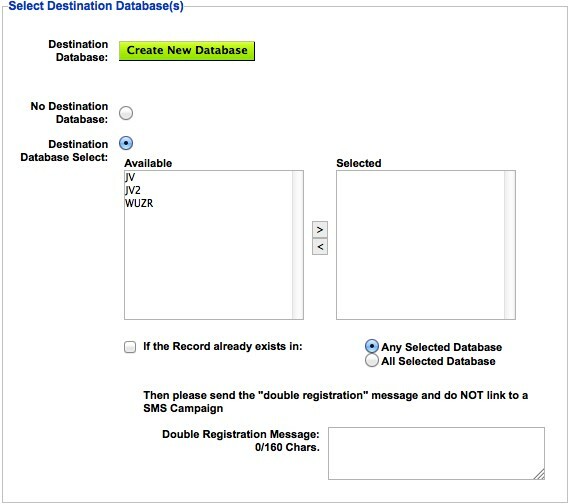 You may choose to avoid database selection entirely by selecting the No Destination Database radio button. If you do want to associate an existing database with this widget, then look to see that at least one database already exists in the Available listing. Follow the steps below to manage your databases. If you want to take action when a duplicate entry is found in a database, check the If Record already exists in box. Then, decide if you want to check all databases by clicking the All Selected Databases radio button. In the Double Registration Message field, enter the text that you want to send if a duplicate record is found. To display a confirmation message, first check the box for Confirmation Message. If you want to simply display a message within the widget, click the option for Send confirmation message to the widget and enter the Confirmation Message. Instead, if you want to redirect to another page to display the message, click the option for Go to a confirmation page, enter the URL, and then (optionally) choose to display the target web page in a New Window. You might also want to send a confirmation text message to the phone number in the database record. If so, then check the box for Send Text Message to the Record’s phone. You can also initiate a campaign by checking the box for Activate a SMS Campaign. From the drop-down listing, choose the campaign you want to activate. When you are done, click Next to move on to the final step of the wizard, Generate Code. If you want the widget to appear as a popup, click the Generate Popup Code button. Click the Copy button and then paste the code into a text editor of HTML editor. 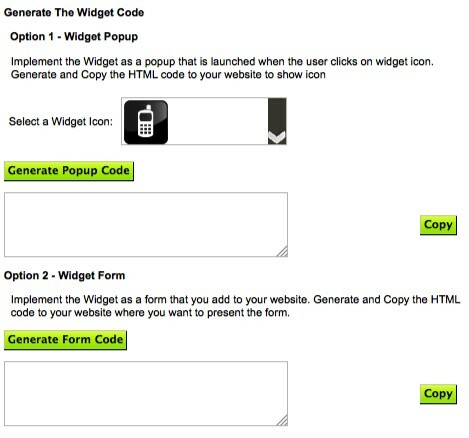 If you want to embed the widget into a form, click the Generate Form Code button. Click the Copy button and then paste the code into a text editor of HTML editor. Click the Save button to commit your changes and complete the wizard.